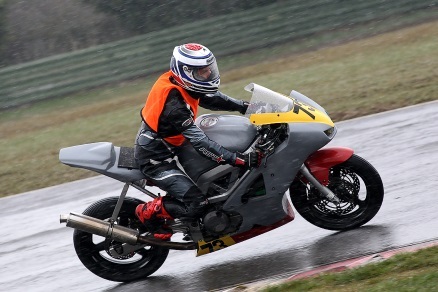 Snetterton saw the first round of the bemsee 2013 season in march. After arriving late Friday night for my first ever race, and with my wife and two daughters in tow, we pitched a 5 man tent in the dark and against all the odds as the gail force winds tried to blow it away. Once erected and tied to the car we all climbed in and sheltered until the morning. Saturday saw a very bleak first qualifying session, it was bitterly cold and the rain fell. The track was completely unknown having never ridden it and was especially slippery with a wicked wind for added complication. My first qualy session went ok, I finished 19th overall that equated to 5th rookie with a time of 3:16.813. Race 1 was more of the same, but the rain had turned to snow. I finished the race with an iced up visor. Fortunately for me the adrenalin kept me warm and I only knew how cold it was because my wife and daughters made sure I didnt forget. I completed the first race in 22nd, 9th Rookie with a fastest lap of 3:09.805. Race two was cancelled as the snow had started to settle in the gravel traps making it unsafe for the marshals. The weather was cold for the rest of the weekend and we woke up on Sunday in an snow covered and frozen tent. Sunday was also cancelled and my first race weekend saw me complete qualifying and one race.